Operating Systems, Windows 8 and 10 have a feature which allows only those drivers to get installed which are digitally signed by Microsoft. This feature is known as ‘Driver Signature Enforcement’. It imposes restrictions on unsigned driver installations. Therefore, if you wish to install a driver which is not signed by Microsoft, you will need to disable this feature. Usually developers would need to disable this feature to test unsigned developed drivers. 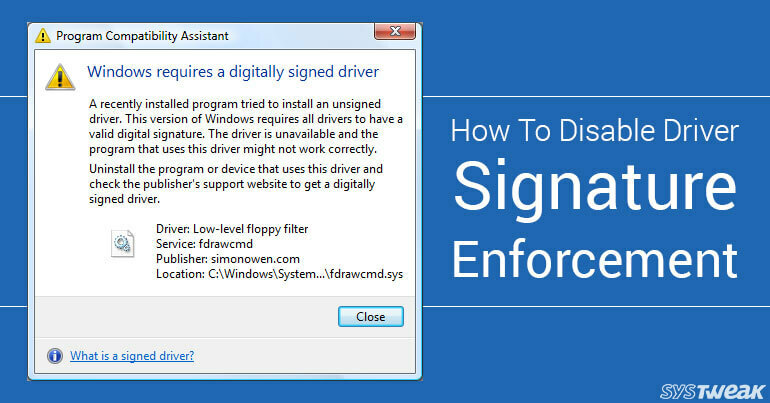 Please Note: Disabling “driver signature enforcement” will uncover you to incompatible and malicious drivers and can make your PC unprotected. So, only install unsigned drivers that you trust. Windows command prompt is an important tool to perform almost every task. Using command prompt, you can enter the ‘Test Mode’, which is already provided in Windows 8 & 10, that allows users to test and install unsigned drivers. On the desktop screen, press Windows and X keys together, and click on Command Prompt (Admin). Now press “Yes” on the popup window to run Command Prompt as an administrator. Once you enter the Command Prompt, just type bcdedit /set TESTSIGNING ON and press Enter key to enter the Test mode. Now you can install unsigned drivers on your system. Also, you can disable it once you have completed your task by typing bcdedit /set TESTSIGNING OFF in Command Prompt (Admin) and press Enter key. Click on Start and select ‘Settings’ option or simply press Windows and I keys together. Once you enter Settings, click on Update & Security. Now click on ‘Recovery’ option from left panel and select ‘Restart Now’ from Advanced Startup on right panel. Under Advanced Options menu, click on ‘Startup Settings’. After entering Startup Settings, click on Restart. Finally, your system will boot with disabled Driver signature enforcement. So, if you wish to install any unsigned but trusted driver in your windows 8 or 10 system or if you are a developer and wish to test your developed driver, you can simply follow any of these two ways.